Want to make the entire crop of egghead critters? Find instructions for the rest of the creatures at our Easter egg decorating party. Color Hard-boiled Eggs: Before you begin decorating, cover your worktable with newsprint. Set out plastic cups with assorted colors of prepared egg dye, either homemade (For each color, stir one cup of hot water and one teaspoon of white vinegar in a plastic cup. Then stir in 10 to 20 drops of concentrated food coloring) or store-bought. Have a roll of paper towels on hand and plenty of hard-boiled white eggs. Let the kids take turns submerging eggs into the dye until the eggs reach a desired shade. Gently blot excess dye with a paper towel. Set the eggs atop plastic bottle caps to dry. For eyes and spots, draw circles on the eggs with a birthday candle or crayon before submerging them in the dye. 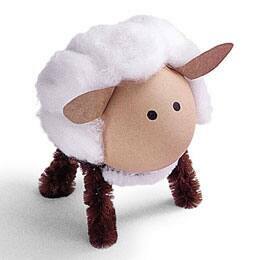 Sheep: To make this brown egg in sheep's clothing, glue on cotton balls and brown paper ears. Draw on eyes with permanent black marker. Craft Pipe Cleaner Legs: Set the decorated animal on a pipe cleaner stand. To make one, bend a pipe cleaner into an oval and twist it closed, using the excess as a tail. Cut a second pipe cleaner in half. Wrap one half around the back of the oval to form the back legs; wrap the other half around the front to create the front legs. Bend the ends into feet.